In the 70 years that have passed since Joseph Schumpeter coined the term “creative destruction,” economists have struggled awkwardly with how to think about growth and innovation. Born of the low-growth agricultural economies of 18th Century Europe, the dismal science to this day remains focused on the question of how to most efficiently distribute scarce resources, not on how to create new ones — this despite two centuries of rapid economic growth driven by disruptive technologies, from the steam engine to electricity to the Internet. To be sure, there are tipping points in nature, including in the climate system, but there is no way for scientists to identify fixed boundaries beyond which point human civilization becomes unsustainable for the simple reason that there are no fixed boundaries. What do you do when feasible policies aren’t popular, and popular policies aren’t feasible? The carbon price paradox is that any politically conceivable price on carbon can do little more than have a marginal effect on the modern energy economy. A price that would be high enough to induce transformational change is just not in the cards. Thus, carbon pricing alone cannot lead to a transformation of the energy economy. Advocates for a response to climate change based on increasing the costs of carbon-based energy skate around the fact that people react very negatively to higher prices by promising that action won’t really cost that much. … If action on climate change is indeed “not costly” then it would logically follow the only reasons for anyone to question a strategy based on increasing the costs of energy are complete ignorance and/or a crass willingness to destroy the planet for private gain. … There is another view. Specifically that the current ranges of actions at the forefront of the climate debate focused on putting a price on carbon in order to motivate action are misguided and cannot succeed. This argument goes as follows: In order for action to occur costs must be significant enough to change incentives and thus behavior. Without the sugarcoating, pricing carbon (whether via cap-and-trade or a direct tax) is designed to be costly. In this basic principle lies the seed of failure. Policy makers will do (and have done) everything they can to avoid imposing higher costs of energy on their constituents via dodgy offsets, overly generous allowances, safety valves, hot air, and whatever other gimmick they can come up with. We believe that soon-to-be-president Obama’s proposal to spend $150 billion over the next 10 years on developing carbon-free energy technologies and infrastructure is the right first step. … a $5 charge on each ton of carbon dioxide produced in the use of fossil fuel energy would raise $30 billion a year. This is more than enough to finance the Obama plan twice over. 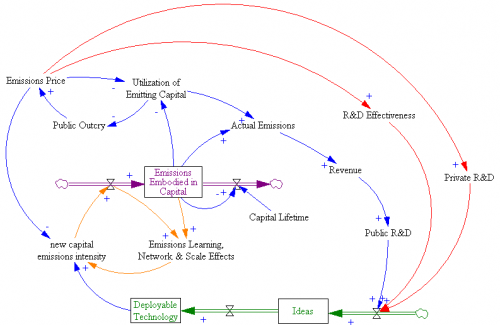 … We would like to create the conditions for a virtuous cycle, whereby a small, politically acceptable charge for the use of carbon emitting energy, is used to invest immediately in the development and subsequent deployment of technologies that will accelerate the decarbonization of the U.S. economy. As the nation begins to rely less and less on fossil fuels, the political atmosphere will be more favorable to gradually raising the charge on carbon, as it will have less of an impact on businesses and consumers, this in turn will ensure that there is a steady, perhaps even growing source of funds to support a process of continuous technological innovation. Implementation of a high emissions price now would be undone politically (B1). 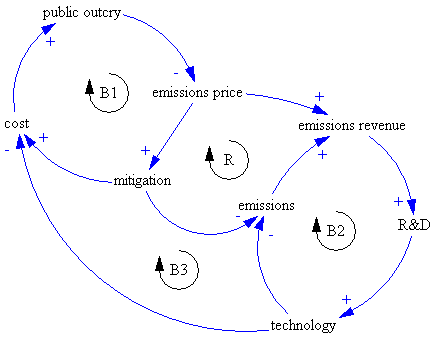 A low emissions price triggers a virtuous cycle (R), as revenue reinvested in technology lowers the cost of future mitigation, minimizing public outcry and enabling the emissions price to go up. 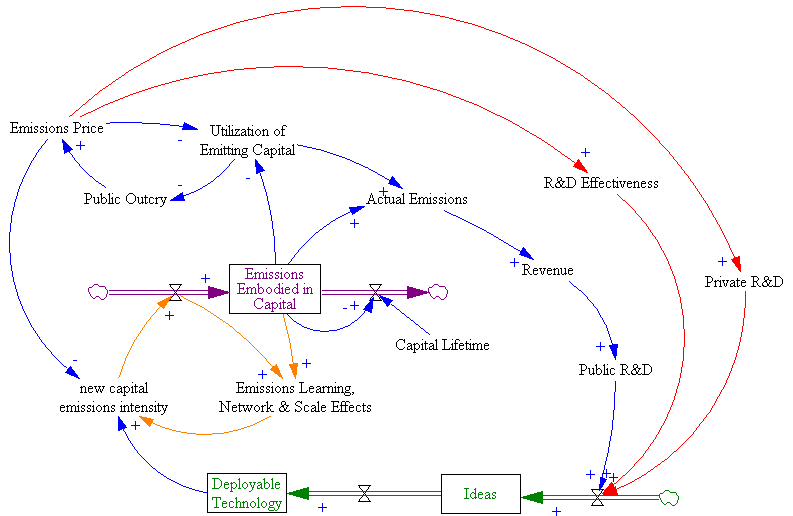 Note that this structure implies two other balancing loops (B2 & B3) that serve to weaken the R&D effect, because revenues fall as emissions fall. Author TomPosted on May 5, 2010 Categories Climate, energy, Policy, TechnologyTags Breakthrough, emissions, Pielke, R&D, tax, Technology2 Comments on Stop talking, start studying? 726 (g) (2) INTERNATIONAL OFFSET CREDITS FOR REDUCED DEFORESTATION- The Administrator shall use the proceeds from each strategic reserve auction to purchase international offset credits issued for reduced deforestation activities pursuant to section 743(e). The Administrator shall retire those international offset credits and establish a number of emission allowances equal to 80 percent of the number of international offset credits so retired. Emission allowances established under this paragraph shall be in addition to those established under section 721(a). This provision makes the reserve nearly self-perpetuating: at constant prices, 80% of allowances released from the reserve are replaced. If the reserve accomplishes its own goal of reducing prices, more than 80% get replaced (if replacement exceeds 100%, the excess is vintaged and assigned to future years). This got me wondering: does anyone understand how the reserve really works? Its market rules seem arbitrary. Thus I set out to simulate them. 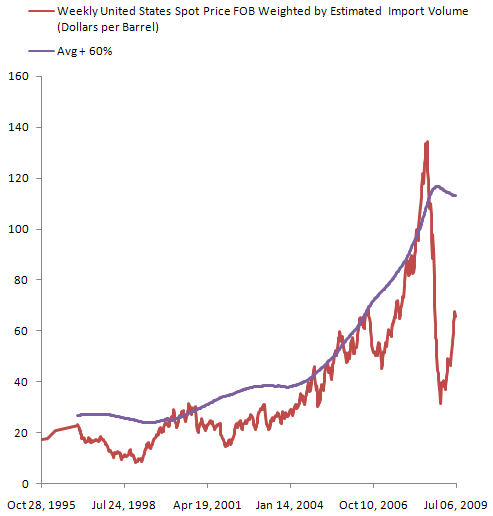 Author TomPosted on July 6, 2009 Categories Climate, energy, PolicyTags ACES, Breakthrough, cap & trade, emissions, Markey, strategic reserve, Waxman2 Comments on Strategic Excess?